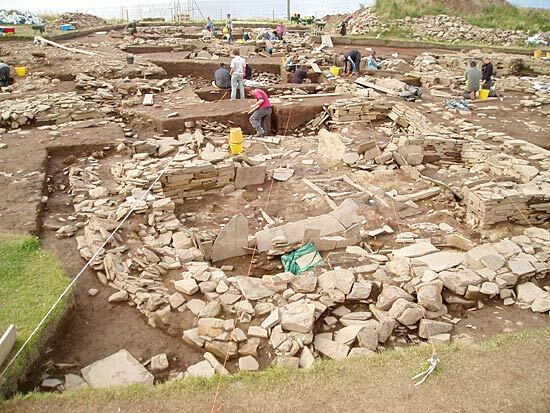 Slowly but surely, excavation at the Ness is declining in pace and in scope. Not through any lack of energy or commitment on the part of the staff or diggers, but simply because the life of any excavation draws to a gentle close towards the end – only to burst into life anew as the major phase of planning and recording begins in the final days. With just one week of work left, that is what will be happening from next Monday. In many ways, this is a sad time. Everyone loves to dig and, as usual, each structure at the Ness teases and tempts those working in it with new conundrums and fresh questions to be answered. Today was no exception. In Structure Ten, having defined the robbed out north wall yesterday, Mike extended a small section back to where the west wall might have survived, although clearly robbed out. 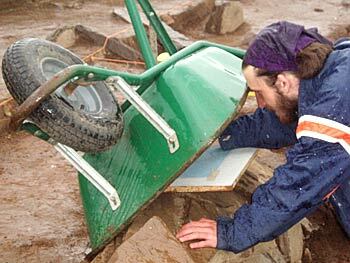 He found the robber cut (the signs left in the soil where the intrusion and stone removal had occurred) and in front of it uncovered a series of flat slabs. Could this be another dresser? Time, and perhaps excavation next year, will tell, but Structure Ten is maintaining its reputation for surprises. Elsewhere in the structure, Claire and Alan continued their work on defining the northern robber cut, and in the central area Scott continued to take readings with his portable XRF machine. These will be refined in months to come and will provide vital information for the interpretation of both the building and the artefacts. Outside Structure Ten, in the upper most fills of the passageway that runs right round the building, Ingrid and her team continued to examine the bones which fill the passageway. As expected, the first bones examined were cattle (and again mainly tibia) but, surprisingly, she found the articulated skeleton of a young red deer. This is an important discovery as the association of red deer with deposits in the Neolithic does seem to have a deeper significance than might be expected, as has already been noted at the Neolithic site at the Links of Noltland, in Westray. Articulated bone is also important because it has not been moved about over time (or it would have disintegrated) and thus provides good dating evidence for the context in which it is found. Yesterday, we mentioned that the latest evidence suggested that Structures One and Fourteen may have been contemporary. A further sondage dug today has now thrown some doubt on this. 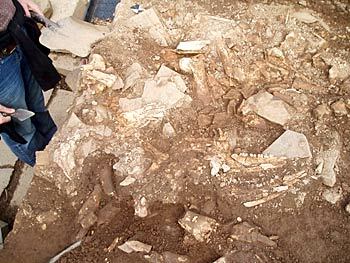 However, examination, by Nick, of details of a trench dug in 2005, between the site hut and the location of Structure Fourteen’s trench, suggests that the 2005 excavation may have uncovered the end wall of the building. If this turns out to be accurate, Structure Fourteen will have a length somewhat in excess of 15 metres. Visits to the site from national and international media continued today with a photographer from The Times. His work will accompany an article, which will be published next week. And now, at the end of the day, the heavens have opened and so the digging had to come to an abrupt end – not a fitting finish for those whose last day on site was today. However hearts were lightened with dig director Nick hosting his usual end-of-dig soiree, straight after work – there will no doubt be a few sore heads tomorrow! My name is Sarah Cobain. 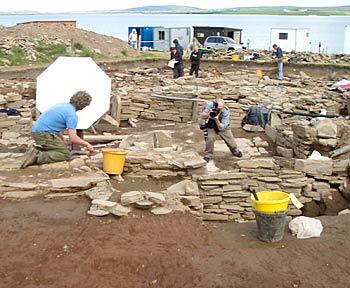 I have come up here to Orkney from Gloucestershire, where I work as an archaeobotanist for Cotswold Archaeology. This is my fourth season working on the Ness and this year Nick has allowed me to return from social isolation (!) excavating the “Lesser Wall of Brodgar”, in Carole Hoey’s front garden, to work in Structure Ten. I initially started working in Structure Ten in 2008, when it was first revealed and myself, and a group of friends, removed large amounts of rubble from above the structure. It has come a long way in the last four seasons and this year it was great to see the walls making a bit more sense and floor layers revealed. My job for the past two weeks was to excavate the central hearth within the structure. The hearth contained a number of burning layers, most likely from peat fires and even a couple of finds – some animal bone, burnt bone a couple of pieces of pottery, a skaill knife and a piece of cramp (fuel residue from seaweed/kelp burning). It has been another exciting season with lots of nice finds, unfortunately today is my last day. However, I am hoping be back next year to see what else turns up! Hey there! My name is Kelsey, and I am a student from Willamette University in Salem, Oregon, in the USA. While I spent the last four years living in Salem attending school, I grew up on the Big Island of Hawaii, and have traveled nearly half-way across the world to be a part of the Ness of Brodgar excavation this season. At Willamette, I am a double major in archaeology and environmental Science. I graduated from Willamette just this past May, but still needed to participate in an archaeological field school to complete my archaeology major. And what a field school experience it has been! As my last course through Willamette and my first field season ever, I am sad to see it coming to a close, but my time spent here has been exciting and rewarding in ways that I never expected. On my first day on site, I was herded into a trowelling line in Structure Twelve, along with the other Willamette students, but quickly found a home in the “porch” or annex where I spent the next several weeks, excavating layer after layer of Neolithic pottery. Yes, that’s right, layer after layer of up to 5,000-year-old pottery, once worked and fired and utilised by Neolithic peoples in Orkney; how incredible! It was both a lesson in patience and great practice in precision trowelling techniques, but I feel lucky to have had the opportunity to excavate here. Through this experience, I developed an ownership to the area and Structure Twelve and a unique attachment to the Ness of Brodgar as a whole. In retrospect, I realise that the attachment I now feel is a result of the incredible learning environment that the Ness of Brodgar is. I have come to admire and respect all the people who have, at one time or another answered my endless questions and taught me how to think with the mind of an archaeologist. My site supervisor, Owen, has been integral to fostering my continued interest in archaeology and confidence in myself. 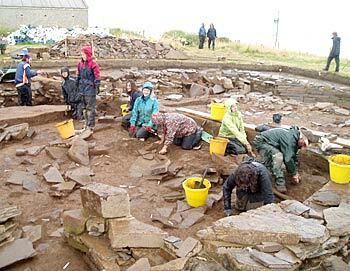 Our site director, Nick, has also shown a great desire to make the Ness of Brodgar a learning environment for everyone, a characteristic that it seems he passed along to all the hard-working people onsite. I feel incredibly lucky and thankful to have spent a field season at the Ness, from excavating pottery to learning geophysical techniques to creating a network of fellow archaeologists with a passion and a purpose for doing great work. Both the wealth of knowledge I have gained thus far and the incredible advances made during this season are a testament to the wonderful site that the Ness of Brodgar is, and I surely hope to come back again in the future.